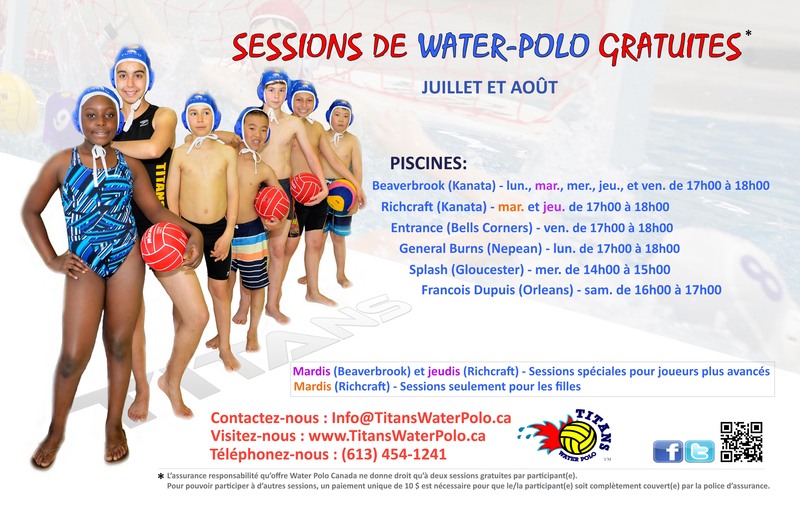 We invite all of you to join us and experience this amazing Olympic sport at one of Ottawa outdoor and indoor pools this Summer. Ottawa Titans Water Polo Club will offer free water polo promotional sessions across the city (East, Central, South and West). Please, check bellow for specifics (the schedule). We have reserved advanced weekly sessions at Beaverbrook on Tuesdays (Kanata) and Richcraft on Thursdays (Kanata) pools for kids with more advanced water polo or swimming skills. There will be series of special girls only water polo opportunities for female athletes. All are welcome, no specific skills are expected. These girls only sessions, scheduled weekly for Richcraft (Kanata) pool on Tuesdays, are in addition to all other sessions open to everyone.